Click image to view more photos. event in our outdoor space. 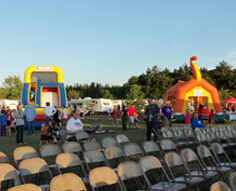 When planning an outdoor event, there are many variables to consider. Weather, parking, seating, and providing food just to name a few. With so many responsibilities and items to consider, why not leave some of the responsibility to the event specialists at The Expo Center. We merge our unmatched event space with outstanding amenities to make your outside exhibit, tradeshow, or sporting event the best it can be. Our Eau Claire outdoor exhibit space provides you with optimal space for your event, including a pavilion featuring full kitchen and concession stand. Nestled on 25 acres of land, you can customize this flexible space into an elegant wedding reception, large fair, agricultural show, or corporate picnic. Visiting The Expo Center? Sit back and relax. When you visit our Eau Claire corporate and special event center, every detail is taken care of for you. From parking to food, all you need to do is show up! Relax, refresh, and retreat at the Eau Claire Exposition Center! Learn more about visiting The Expo Center in Eau Claire. The main exhibit hall can comfortably hold 150 people sitting. Along with plenty of prep space, The Eau Claire Expo Center has a fully equipped commercial kitchen. The acres of space allow for lots of free parking. 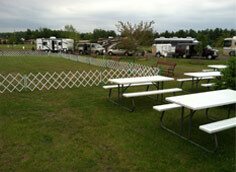 In fact, it provides 270 spots on paved lot and 2,000 open air spots. Newly landscaped, our gardens are the ideal spot for family picnics, outdoor weddings, or walking your dog. Besides being a great space to hold events, we have multiple large buildings great for storing vehicles, boats, or equipment right here in Eau Claire.